Today’s blog post is by Cathy Armato, owner of Icy, a Therapy Dog. She is also a blogger at Dogs Luv Us and We Luv Them. To learn more about Cathy Armato, visit our About page under Contributors. Years ago I read a couple of books that talked about Therapy Dogs and how they help people in need. I remember being so impressed by how pets that aren’t trained Service Dogs can help children and other people in need. I thought it must be a wonderful thing, to be able to give back to the community with your dog (or other pet) right by your side! There are many benefits of the Human-Animal Bond to human health and well-being. A visit from a Therapy Dog can help provide some of these benefits. In the back of my mind I hoped that one day I might have a Therapy Dog and together we could help people too. A few years later we got our Siberian Husky, Icy. Right from the start Icy had that rare gentle, sweet temperament that I knew might make her well suited for Therapy Dog work. Early on, I thought about the possibility of her becoming a Therapy Dog some day and I looked forward to an opportunity to see if she had what it took to do so. A year later I got my chance! Therapy Dogs need to be at least a year old so as soon as Icy turned one, I enrolled her in a Therapy Dog training class at PetSmart. She had already gone through their Puppy training classes, and later earned her AKC/CGC certification (American Kennel Club’s Canine Good Citizen). Obtaining the AKC/CGC certification is recognized as the “Gold Standard” of dog behavior. It demonstrates that you are a responsible dog owner and that your dog has manners! The AKC/CGC is often the first required step in most Therapy Dog programs. The training class prepared us for the Pet Partners evaluation which is required in order to become a Pet Partners Therapy Dog. There are other organizations that certify Therapy Dogs but I chose Pet Partners because they have been certifying dogs for a long time and have a solid reputation. A Therapy Dog is not the same as a Service Dog. The Therapy Dog’s job is to offer comfort, emotional support, and smiles! A dog doesn’t need to be any kind of purebred dog or know how to do fancy tricks to become a Therapy Dog. The key attributes of a successful Therapy Dog are a gentle temperament, being well socialized with both people and other dogs, and having solid, basic obedience skills. Therapy Dog Icy listening to a young student read out loud to him. Icy and I have been a Therapy Dog team for nearly 4 years. We have participated in several different programs, but Icy loves kids so her favorite programs are those that involve children. 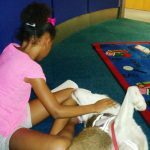 One of the programs Icy participates in is the Reading To Dogs program, where children read out loud to Therapy Dogs at the library. Reading out loud helps improve a child’s reading skills and is particularly beneficial to kids that struggle with reading. Going to a library, seeing a dog there, and being able to read to the dog as you pet them is very motivating for kids. It’s also a totally judgment free environment where kids who don’t read well can feel relaxed and “safe”, knowing they won’t be judged, graded, or laughed at by the other kids if they don’t read well. Reading out loud helps children hear how the text sounds, which helps improve their reading skills significantly. Reading to dogs can help a child build confidence in their reading ability without fear of judgment or embarrassment by parents, teachers or other kids. 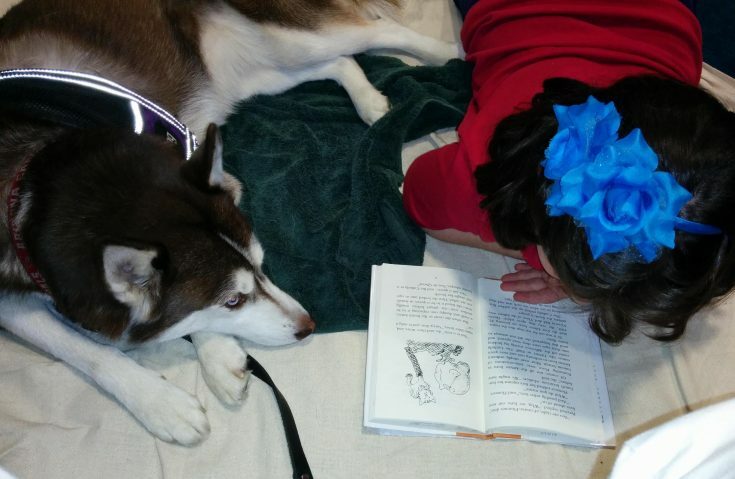 Reading to Dogs is Fun and helps motivate reluctant readers who don’t like to read, or are afraid they won’t read well. Kids can fall behind in reading for many reasons. Programs like this can be a great addition to their reading education. It’s free, it’s fun, and it’s effective in helping kids improve their reading skills! Reading programs can take place at libraries, schools, bookstores, hospitals, and homeless shelters. 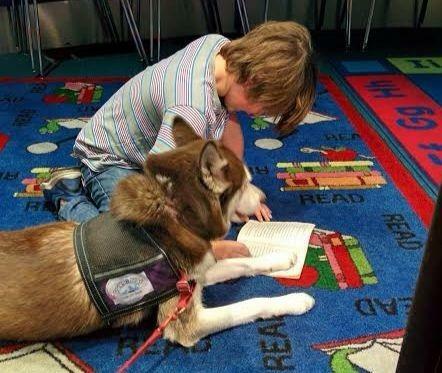 It’s really fun and so rewarding, we love the Reading To Dogs programs! Another program we really enjoy is our visits with the Girl Scouts. A few times a year Bideawee, the shelter we do our Therapy Dog work through, invites Girl Scout Troops to meet some of our Therapy Dogs. We talk about how the dogs help people and about the difference between a Service Dog and a Therapy Dog. We also take the opportunity to talk about proper pet care and the importance of animal sheltering. Teaching kids how to properly care for and be kind to animals is important, not just for the animals but for the children as well. It teaches kids responsibility, compassion and empathy. “How do you know if a dog is sick?” and “What do you do when a dog gets sick?” I asked them how their mom knows when they are sick, other than telling her they don’t feel well, and explained that a sick dog has many of the same signs as a sick kid; vomiting, diarrhea, or not wanting to get up and play. We talked about how important it is to take your dog to the Vet quickly if s/he is sick. Talking with kids like this is a great way to lay the foundation for kindness to animals, the proper way to care for pets, and the beauty of the human-animal bond. A few days after blizzard Grayson delivered a “Bomb Cyclone” to the Northeastern US we had a visit from a group of Brownies (a Brownie is the step girls go through before becoming a Girl Scout). I thought the timing of our visit was a great opportunity to talk about keeping pets safe in cold weather. The girls were 8 year-olds in the 3rd grade. I started off by mentioning the crazy snow storm we just had and asked if they enjoyed having a couple of days off school. It was no surprise that I got a resounding Yes! I then asked if anyone could tell me some things we need to watch out for with pets in the freezing cold weather. I was impressed that a couple of the girls said not to keep dogs outside for too long and to put a sweater on their dog. “Can dogs get frostbite?” I explained that yes, they definitely can get frostbite, and that their ears are particularly prone to frostbite. “Does Icy ever slip on the ice?” I admitted that yeah, she has slipped a few times. Especially when she bounds across the yard and jumps onto the back porch steps, which tend to get slippery in very cold weather. A really interesting question was “How long can a dog stay outside in freezing cold weather?” That was a tough one! There is no one length of time for every dog. I told them that it depends on the dog, the breed, their size, and just how cold the temperature is. I told them to keep a close eye on their dog to make sure they don’t get too cold or appear uncomfortable. I told them that in freezing weather my little dog Phoebe can only stay out for about 10 minutes, but that Icy could stay out for about 30 minutes because of her breed and her thick fur. It was funny, they kept yelling out various periods of time – they seemed particularly interested in exactly how long a dog could stay outside in the cold, LOL! I have to say, I was glad to see that they take how to keep pets safe in cold weather so seriously! “Can dogs get hurt like we do when they play?” One of the girls talked about YouTube videos she watched that showed dogs jumping and doing things that looked like the dog may have gotten hurt. What a Smart girl!! I explained that yes, dogs can definitely get hurt if they play too hard or if we put them in situations that aren’t safe, like making them jump off something really high just so we can get a cool video from it. I told them that it’s up to us to keep our pets safe and make sure they don’t do things that might hurt them. After our talk the girls all had a great time petting the Therapy Dogs and giving lots of belly and chin rubs. I was really inspired by their interest and obvious love for animals. I loved hearing their questions and comments, and seeing them so engaged in our conversation about pet care! We look forward to lots more visits with kids coming up in 2018! A wonderful post! I love the important work Cathy and Icy do. Such a great article – sharing! Dorothy, thanks for sharing this post! Icy does a wonderful job and I’m happy to know that others are spreading the word! This is beautiful and inspiring. Compassion is a vital requirement of holding society together.﻿ Love this post very much!